Brushing and grooming your dog and the hair is a crucial part of keeping your pet healthy. Many pet owners are too busy with their own work and stress to see that dogs also need the same tender loving care that people do. Brushing the coat of your pooch at least once a day helps in keeping the hair from getting matted and also promotes the development of a shiny and healthy coat. Grooming your pet should be an enjoyable task for both of you where you can spend quality time with each other. Regular grooming should help keep your dog comfortable, healthy, and safe from majority infections and diseases. Many owners like taking their dogs to professional pet groomers to have their dogs looking great. However, this can be an expensive task. While many people employ professionals, several like to groom their pets at home. Basic pet grooming should be done at home where your pooch feels the safest and most comfortable. Apart from just getting the health of your dog up, the best part is that regular grooming helps them smell better and keeps their coats soft and clean. Without further ado, let us look at how you can groom your dog. The most important part about grooming pets is that you invest in the correct tools. Searching for tools and equipment after you start grooming your dog can lead to anxiety and stress for your pooch. If you are planning to groom your pet at home, you need a good set of nail clippers or grinders. A faucet spray or hose pipe to control water pressure, dog tub or large bucket, hypoallergenic shampoo and conditioner, dry towels, antiseptic powder, tic solution, cotton wads for the ears, medicated ear cleaning solution, and a low noise speed dryer. Once you’re done gathering all the tools, equipment, and supplies for the bath and grooming, start by brushing your dogs’ hair. Work with your pet to calm them down and remove any knots or matted hair in their mane and body. Detangling dog fur can help ease the strain of shampooing and conditioning significantly. Mats are tough to remove once the area becomes dry. 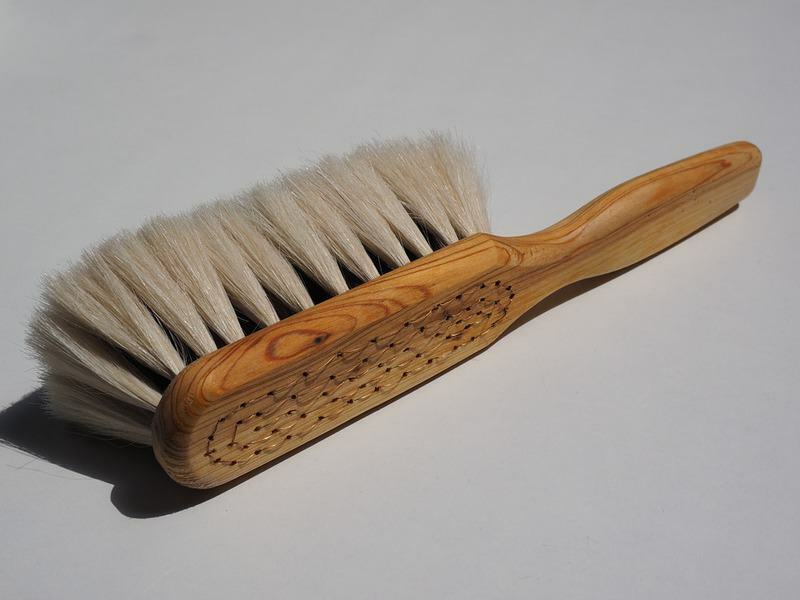 While brushing, if you notice wetness from the matting, stop cleaning and immediately take your pet to the vet. There are high chances that there is an infection that has built up over time. If not, brush till you remove all tangles and knots. Once the dog fur is cleared, get ready to cut your pooch’s nails. You can use one of two type of nail cutters – guillotine or scissor-shaped. Scissor-shaped nail trimmers are excellent for medium to large-sized dogs, while guillotine cutters are perfect for small to medium-sized dogs. If you are unsure about how your dog would react to the sight and feel of nail trimmers, it is best to invest in a good quality nail grinder. These also help in protecting the nails with a safety feature that helps avoid over-sanding of the nail. Read our reviews on the best dog nail clippers to find out what will suit your dog. Once you are done brushing and clipping the nails, it is best to give your dog a quick trimming. Long-haired dogs require more trimming around the chest, belly, hocks, and pads than shorter ones. Short-haired dogs need trimming around the privates, belly, tails, and paws. Be careful while cutting your dogs’ nails since some pets might get skittish around sharp objects. Being patient and offering treats and occasional hugs can help keep them calm and make the experience less stressful. Use a medicated wax cleaning ear solution to clean out your pets’ ears. Bring the solution to room temperature and with the help of a few cotton wads (without digging deeply), clean out the ears of your dog. Since pets tend to play outdoors and love rolling about on the floor, their ears may get dirty very fast. Introduce your dog to water and shampoo gently. Offer hugs, tasty treats, verbal encouragement, and friendly rubs so that your dog may enjoy the bathing experience. Keep careful control of the temperature of the water since it should not be too cold or too hot. Another good idea is to use some anti-slip mats so that your pooch has good control over the footing. First use a hypoallergenic shampoo, then the conditioner and gently wash your dog down. Drying can be very taxing for some dogs. Towel dry completely and then use a low noise speed dryer to finish off the job. Ensure your pet is wholly dry before letting them loose. Once done, apply a little tic solution to their nape and let them go!